and preserve the value of your car. paint and value of your vehicle. for small dents, dings, creases and hail damage! DentXpress is the highest rated and most reviewed paintless dent repair company in Charleston, Tell us what you think! Want to know more about Paintless Dent Repair and how we can erase painful dents and dings from your car in record time without hassle? Here are some of our frequently asked questions and answers. 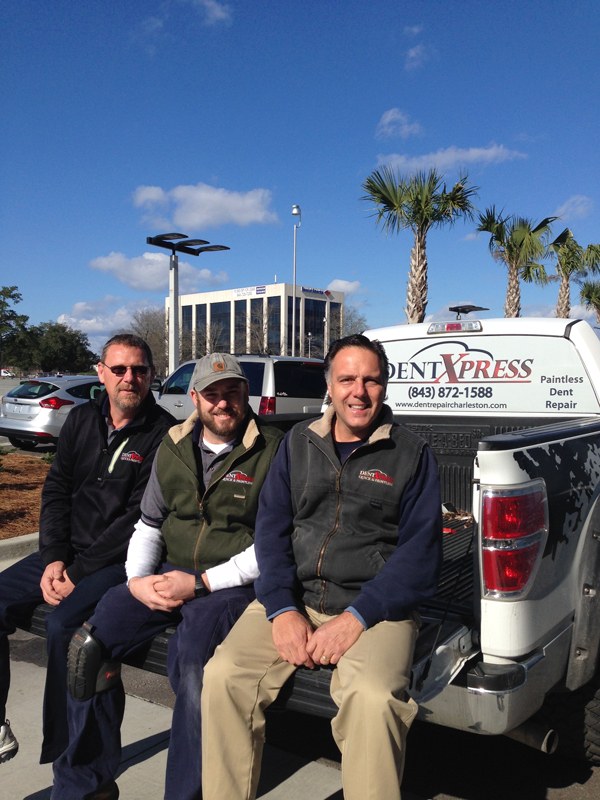 The DentXpress master dent removal technicians have a combined 30 years experience in Paintless Dent Repair in Charleston, SC and the surrounding areas. Our company has provided fast, affordable, quality dent repair and removal services to the tri-county area of Charleston SC from Summerville to Mount Pleasant since 1993. Our paintless dent removal services are guaranteed to restore and preserve the value of your car. Try our mobile dent repair services today! Paintless Dent Repair is the fine art of removing dents, dings, hail damage, and larger dents from a vehicle without costly painting or refinishing. Using specialized tools, DentXpress paintless dent repair technicians carefully manipulate the inside of the car’s body to permanently remove dents, dings or hail damage and restore the car’s body to its original shape. Today’s vehicle paints are remarkably flexible and often will retain its original shape, so when a dent is “massaged” away, you are often left with no visible trace of a dent on your car. Our Paintless Dent Repair services are a perfect and permanent solution for small dents, dings, creases and hail damage!